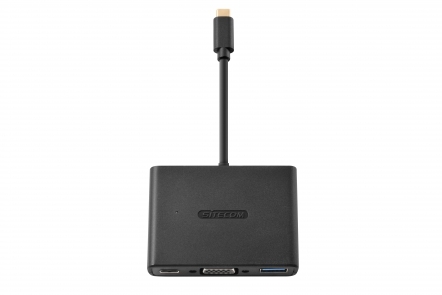 The CN-364 USB-C to USB + VGA + USB-C 3-in-1 Adapter from Sitecom lets you connect a TV, monitor or projector that uses VGA, any USB device and your USB-C power cord to the USB-C port of your MacBook, Chromebook or Windows notebook. The new USB Type-C connector is slim and sleek and tailored to fit mobile devices as well as laptops and tablets. It features a reversible plug which makes it easy to connect instantly without fumbling around. Connect a VGA screen to the USB-C port of your MacBook, Chromebook or Windows notebook. The USB-C to USB + VGA + USB-C 3-in-1 Adapter supports a maximum resolution of 1920 x 1200 pixels and provides a crystal-clear viewing experience on every screen. 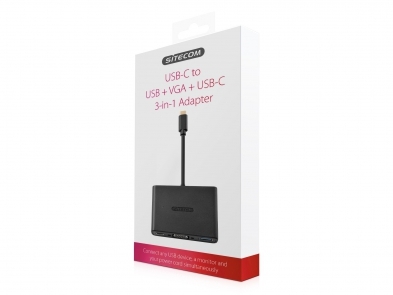 The USB-C to USB + VGA + USB-C 3-in-1 Adapter lets you connect any USB device to the USC-C port of your device. The adapter lets you connect a USB device like a phone, tablet or hard drive to the USB-C port. In need of even more standard USB ports? Connect a USB hub to the adapter and extend your possibilities. The adapter supports SuperSpeed USB transfer rates of up 5 Gbps. It lets you transfer files 10 times faster than with Hi-Speed USB 2.0, ideal for copying Ultra HD movies, music collections and vacation images. The USB-C to USB + VGA + USB-C 3-in-1 Adapter also offers a USB-C port that supports USB Power Delivery. The adapter offers a USB-C port that allows you to connect the USB-C power cord of your MacBook, Chromebook and Windows notebook and keep your device charged while you also have a screen and USB device connected.